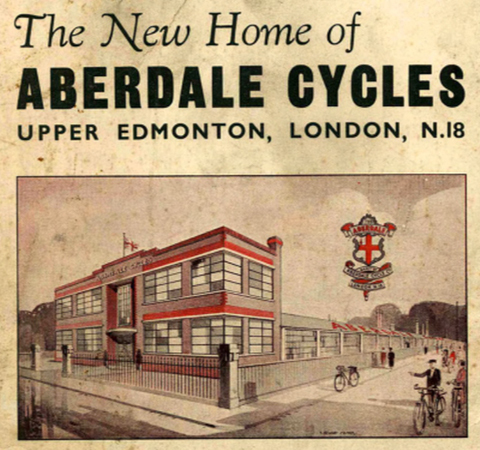 The Aberdale Cycle Co. was founded in 1919 as a family concern, with Joseph Levy joining his father in the business from the age of 14, and graduating within a couple of years to being ‘on the road’ selling their bicycles from a wheelbarrow! Brother Leslie also followed into the growing business, while Joe had progressed to sales manager by age 23. By 1934, Aberdale had moved production to a new factory at Bridport Rd, Upper Edmonton, London N18 (illustrated above). Their bicycle range included the Chromex and Bridport. Their juvenile bikes were known as Rodneys. Joe Levy took over as managing director in 1941, and during WWII, the Aberdale plant became turned over to production of war materials, including the building of a small generating engine set for use on aeroplanes. With the return to peace in 1945, the company introduced the Bown autocycle and, for children, the Gresham Flyer tricycle. This Gresham Flyer is the 1949 model, as illustrated below in an advertisement from that year. The main identifying feature of the early model is a flared front mudguard. Gresham Flyers can be easily identified by the extra tubing behind the boot: when the boot lid is open it provides a support for it. 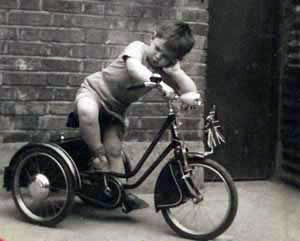 Not so long after the war when just old enough to be allowed out of our back garden, I was proudly pedalling along on my new blue Gresham Flyer tricycle, a Rolls Royce for any boy of my age Hearing the local ‘rag and bone man’ hollering his, “Any rag bone” drew me to the corner of our street where he was standing with his horse and cart. Being the curious type and sat at a convenient height, I was compelled to observe his horse emptying his bowels in the road. Suddenly my father appeared from our house with a shovel. I, not yet having sufficient vocabulary to protest, looked on as he filled the boot of my beautiful trike with steaming horse droppings. I don’t know if the ‘rag and bone man’ had a charge for this extra service but it certainly improved our garden. However, my Gresham Flyer tricycle never felt quite the same after that, although I would regularly run errands for my mother bringing groceries home in the boot.